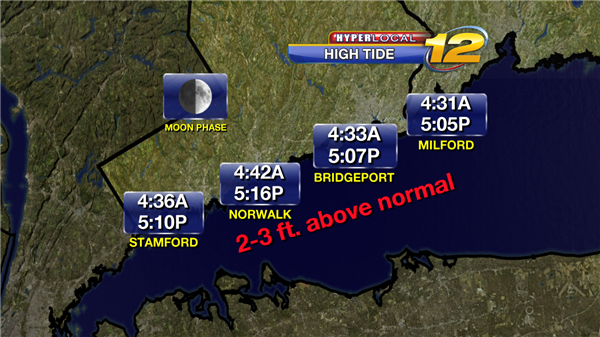 During high tide overnight and tomorrow tides will be 2-3 feet above normal. Coastal flooding will be likely in low lying for prone areas. 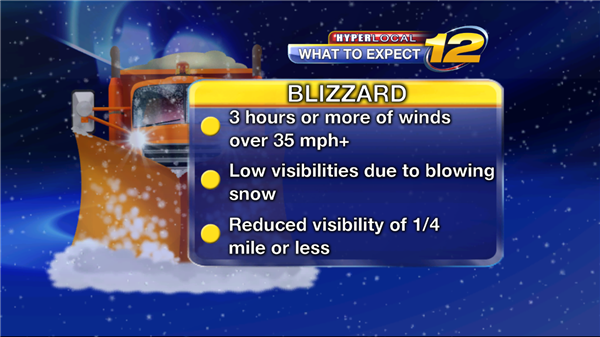 The brunt of the blizzard will hit tonight with snowfall rates of 2-4 inches per hour and gusts over 50 mph. 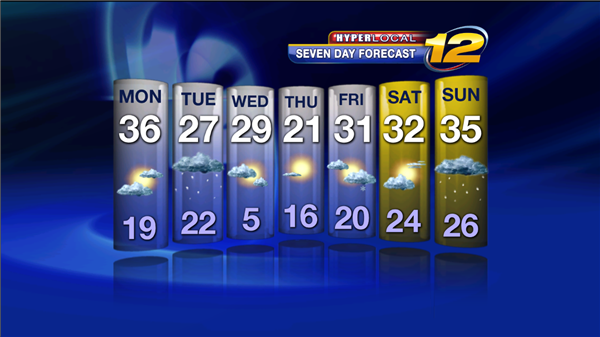 Keep it on News 12 for live weather updates. Since this chance of snow is fizzling out...let's focus on the next chance. 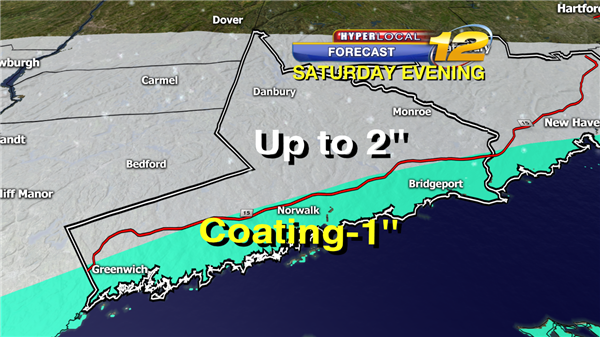 Saturday we're expecting a possible Nor'easter to form and move up the coast. 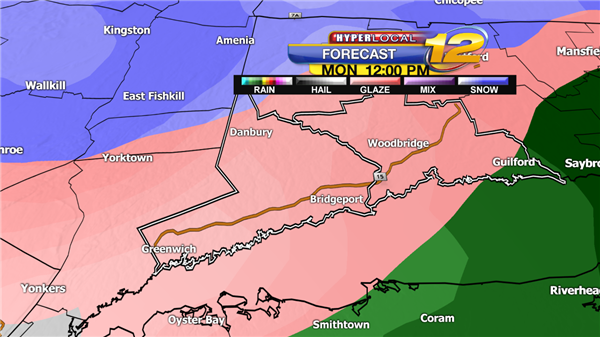 Forecast models are not yet agreeing on the exact storm track and precipitation type. But it will be something we'll be keeping a close eye on in the next couple of days. Just in case...it's good to make sure you have the supplies you need for a bigger snowfall. 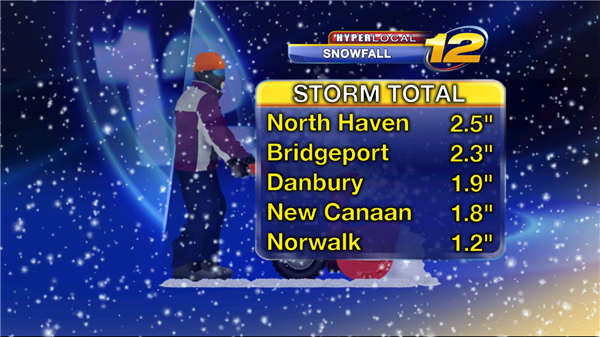 We haven't seen much snow so far this season but it's not over yet. 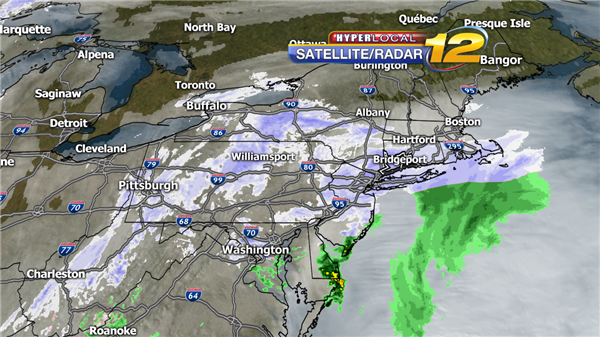 The cluster of snow showers is hitting some very dry air and falling apart this evening. 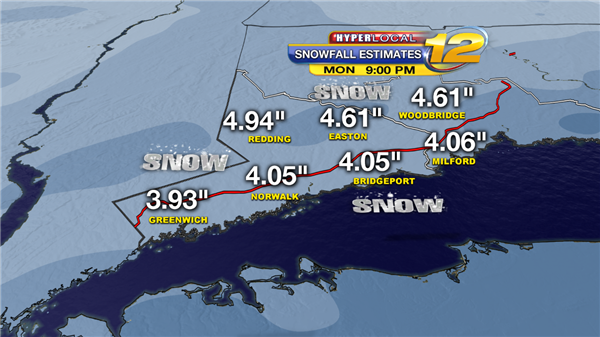 We may not see much if any snow tonight. 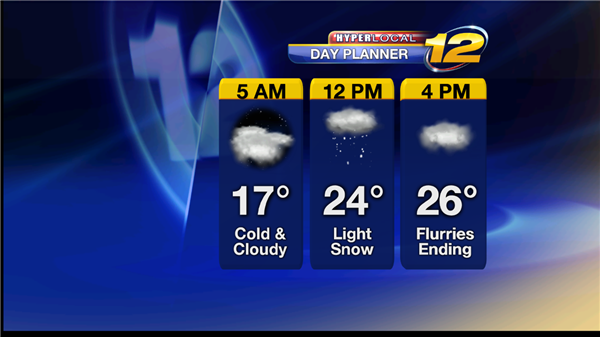 Skies will be partly cloudy with scattered flurries possible until early morning. 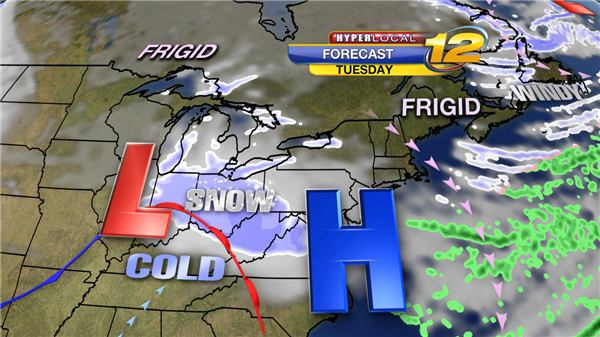 Then we'll see a mix of sun and clouds Thursday with highs in the upper 30s. 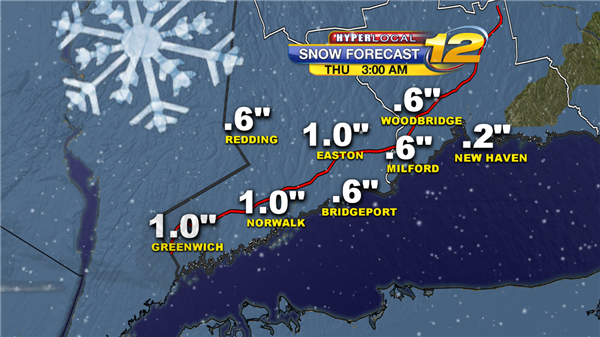 Here's a look at what you can expect for snowfall totals by 3am. 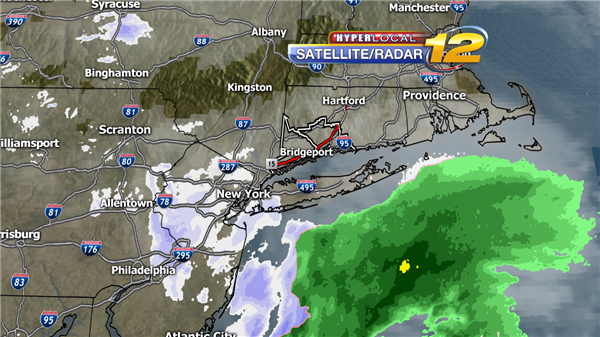 The cluster of snow to our west looks to fizzle out before getting here. 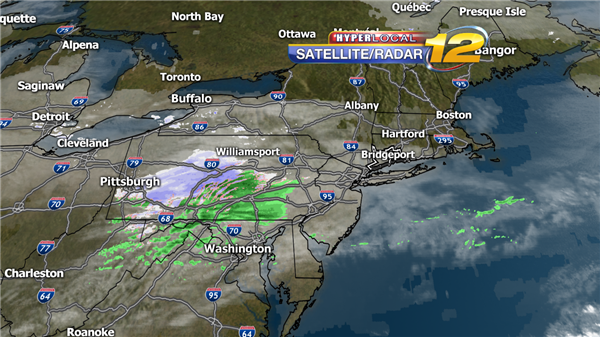 Tomorrow afternoon there will be another cluster of light snow showers that will move over our area. 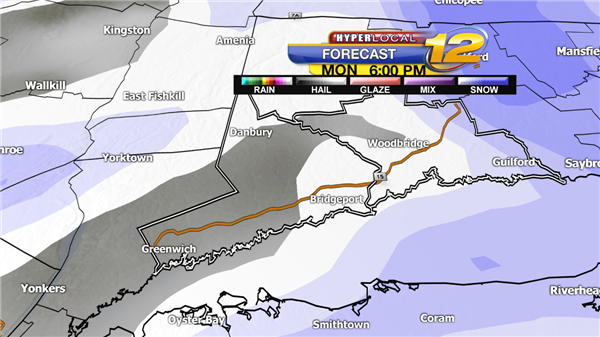 We may see a coating of snow late in the day. It has warmed above freezing across most of our area with clouds rolling in. Tonight expect mostly cloudy skies and a low near 20. 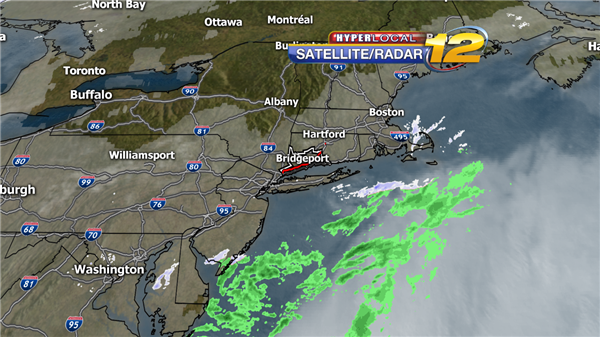 A cluster of rain and snow to our south has caused clouds to roll in today. 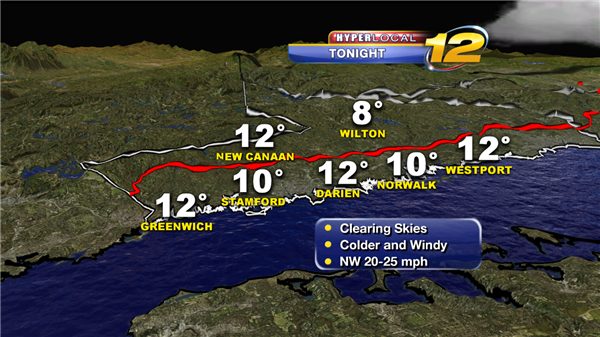 Tonight skies will gradually clear with lows dipping to 16. 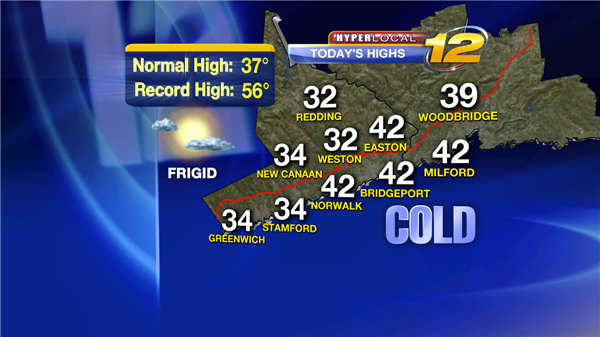 Thursday looks sunny and cold with highs in the mid 30s. We hit the high temperature at midnight in most spots. 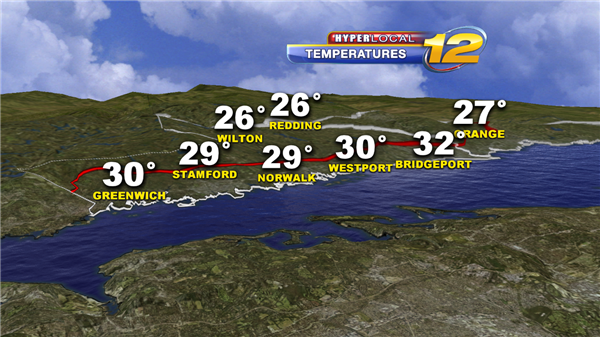 It got colder through the day with most of the afternoon in the 20s. 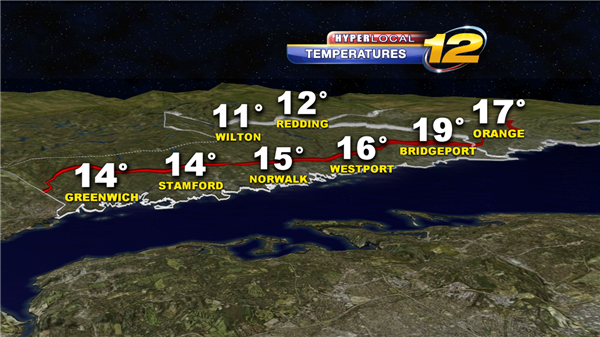 Temperatures are already dropping into the teens tonight. 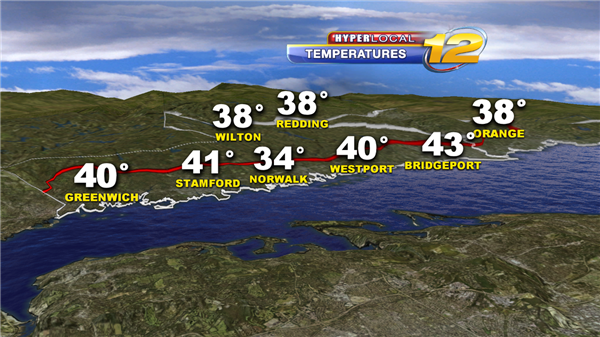 It will cool down a few more degrees before holding steady at 6 north of the Merritt and 12 in Bridgeport. Light rain is moving in with snow to the north. 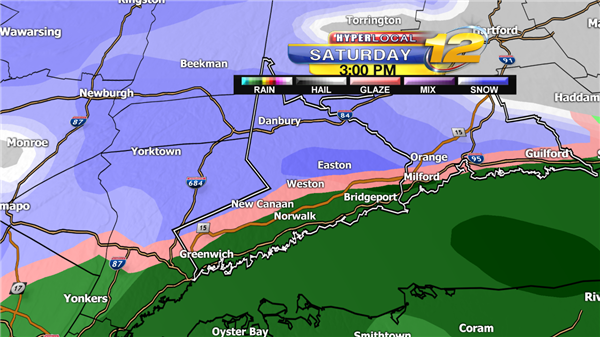 We'll all get a brief snowfall as that line moves south. 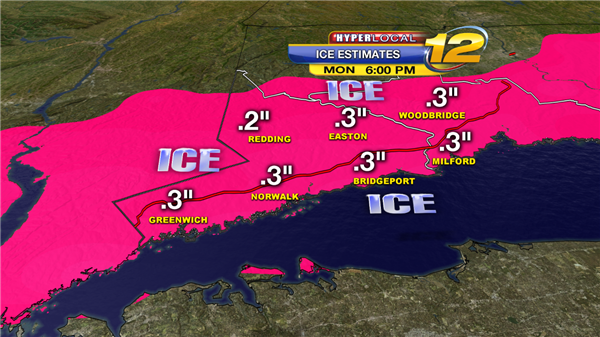 Slick roads will be likely. 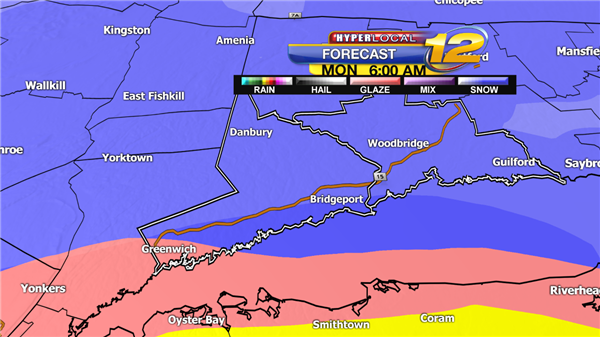 A light coating of snow is expected. 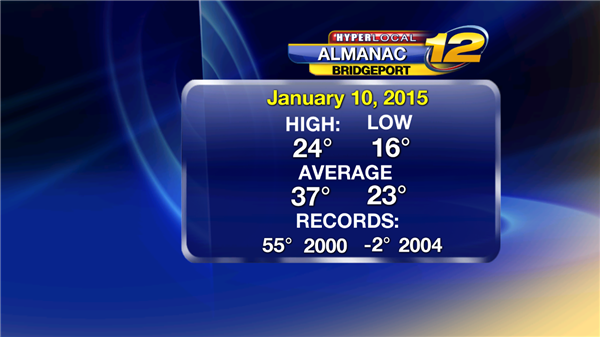 Temperatures were 10 degrees below average at Bridgeport. 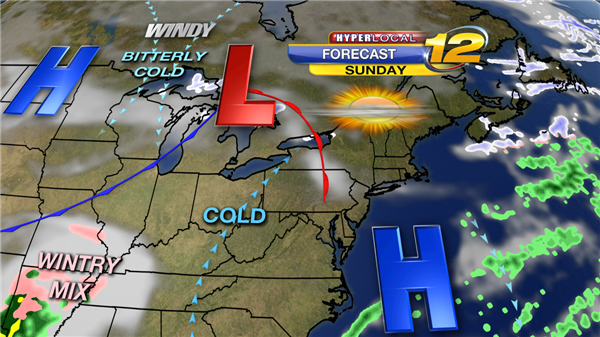 Say good-bye to the bitterly cold weather as a warm front crosses the region Sunday. Moisture along the cold front will bring a messy start to the new work and school week. Get ready! Looks like we'll need to make an earlier than average start for the Monday morning commute as a wintry mix is in the forecast..
Other than Monday's wintry mix, the remainder of the work and school week looks uneventful. 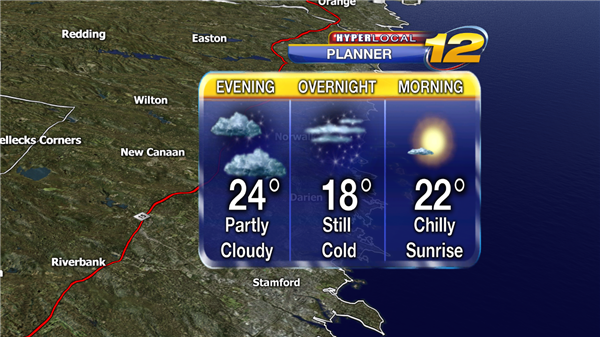 Tuesday planner...Dress in plenty of layers. Winds will slowly relax tonight. Temperatures have been steadily dropping today. 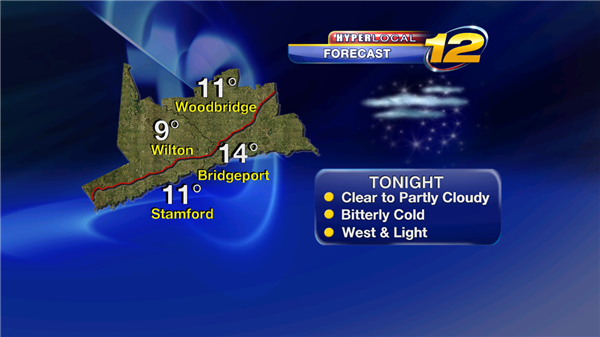 Tonight expect lows in the teens with increasing clouds late. 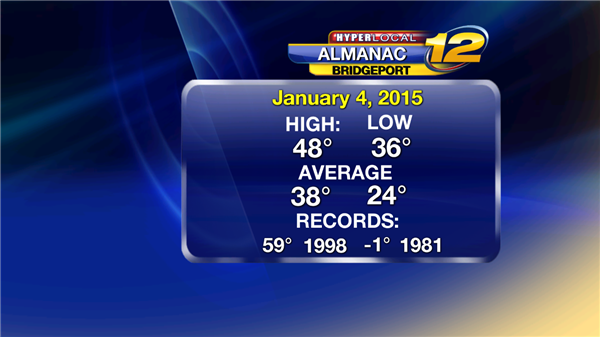 Temperatures were 11 degrees above average at Bridgeport on Sunday. Direr and colder weather moves in through the overnight. 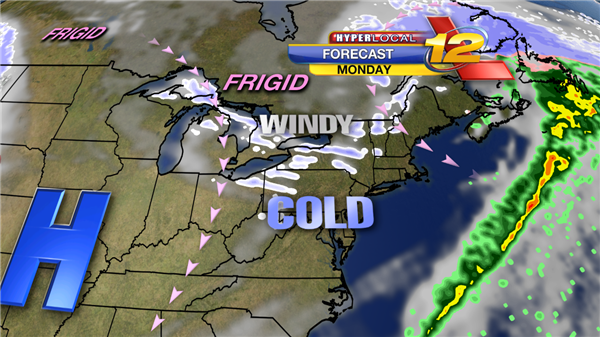 High pressure behind a cold front will bring a northwest pull of much colder air to the northeast. 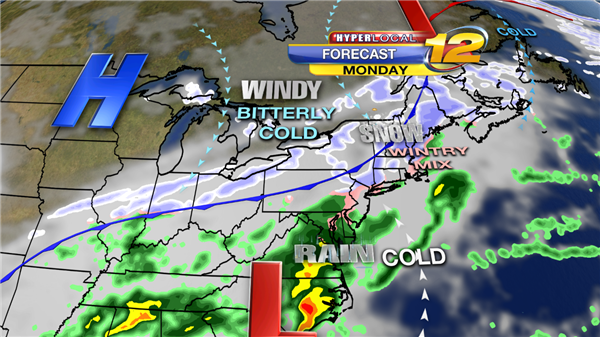 Low pressure approaching from the west will bring a chance of snow late Tuesday and Tuesday Night. Dangerously cold temperatures Wednesday and Thursday Nights. Any snow we see accumulate will not last long but may make roads slick during the afternoon and early evening on Saturday. 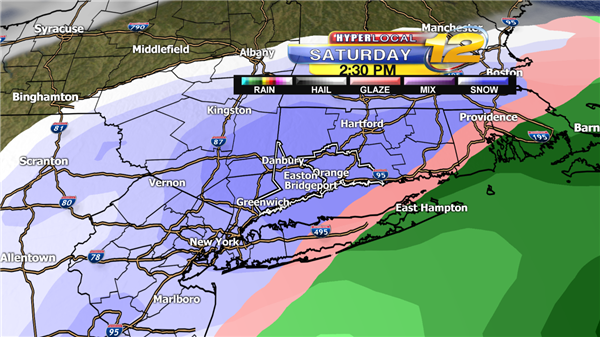 This is what the NAM model predicts our radar will look like tomorrow afternoon. Green is rain along the coast. 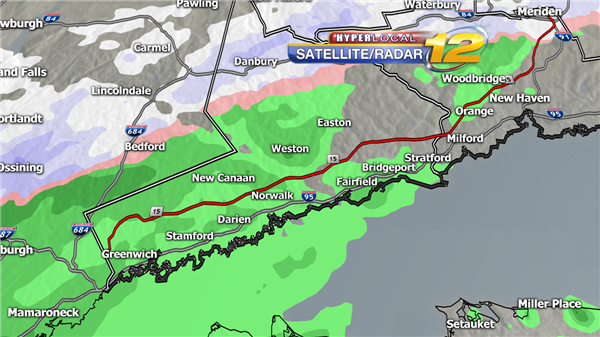 Pink is a mix of rain, snow, and sleet near the Merritt. And north of there is snow. 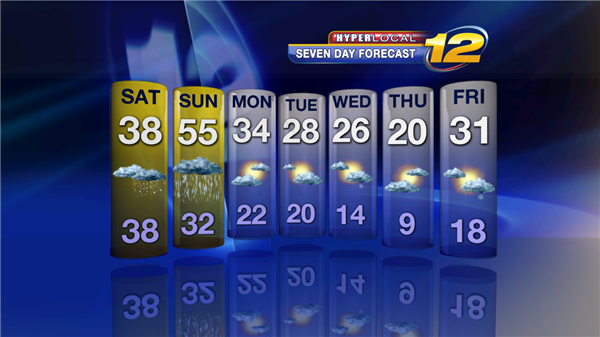 By the evening, temperatures warm into the 40s and it all changes to rain. Rain, at times heavy, will continue into Sunday. 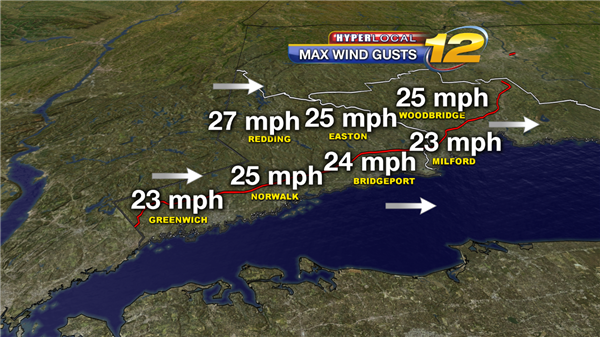 Winds will relax later tonight with mostly clear skies and lows dipping to 25.